This makes sense. In ancient times the traveler was completely at the mercy of his host, both for food and drink as well as shelter and even protection. As the word comes to us from Old French, however, it means guest, or friendliness to guests. Which is the same thing only different, as we shall see. Here the power shifts to the guest who can forgive sin, and the scene is not unlike the time when Abraham “entertained angels unaware,” a model of hospitality throughout both Jewish and Christian history. This roots Christian hospitality in the idea that we should be kind to a stranger who might actually be a lord. That’s why Jesus says to care for strangers is to care for him. 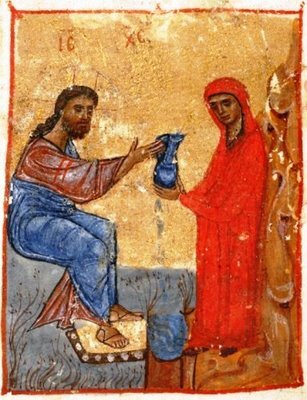 The story of the Samaritan woman shows how this happens. She finds divine surprise, unexpected blessing, in humble service to this one she assumed to share the prejudices of his people. She was actually surprised he would be talking to her, much less asking her for something. But Jesus has something to offer as well. Eternal life. And he also offers us a practical example of how the guest becomes the host. First, he reminds us that it can happen. In a moment we may recognize that the one we serve has served us. The tables can turn in an instance. And he also reminds us that as guests we have the freedom to serve, even if only to stack the dishes. We have about 20 people a week through our home in some capacity or other—and often we are more encouraged and blessed than they are. Over and over we have been tired when the evening began and refreshed when it ended. This usually reflects our guests’ attitudes more than their actions. A cheerful countenance, a transparent gratitude, a friendly hug—all these blessings encourage and delight. And even lacking the power to satisfy our thirsts, our guests can forgive our sins. Or at least overlook them. It is in the context of hospitality that Paul reminds us love covers a multitude of sins. Sometimes the service of a guest comes as thoughtful, even prophetic, questions, such as Jesus asked her. Gracious, engaged conversation is a gift we give our hosts, as he clearly did here. In fact, such courteous and responsive attention is a gift regardless of who gives it. And finally, the story of the woman at the well is marked by honesty and candor. OK, except for the part where she lies about her husband. But the overall tone here shows they treated each other with respect and asked questions that mattered. This was not a conversation without substance or consequence. Mindless banter can never rise to the level of true hospitality. That’s because the thing we finally give each other is our selves and not merely our stuff. We should never be surprised when we have extended hospitality and receive unexpected grace. This is the divine order of things, as the Samaritan woman would be happy to tell you. The last becomes first. The guest becomes host. The tables turn. And Christ becomes Lord. Again. Next Next post: Go with your gut?